Wear this navy blue homecoming dress from iNtrigue by Blush. Beautifully crafted from giving jersey fabric, this blue party dress has a bead-embellished sleeveless bodice with a v-neckline that plunges to the waist of the short pencil skirt. Sheer mesh insets provide coverage and stability to the alluring v-neck and mirrored v-shapes on the sides of the little blue dress. With a slight spin, the open v-back continues the captivating effect of the short homecoming dress. 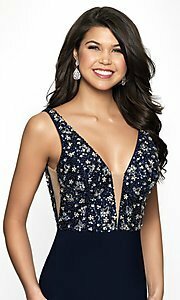 For a statement-making look at hoco 2019 and other semi-formal events, slip on this iNtrigue by Blush navy homecoming dress.